All the fencing supplies featured on this page are available from stock with delivery in 2-5 working days. Here at Oakdale Fencing, we pride ourselves on providing the highest quality fencing and fencing supplies available online. All of our fencing is manufactured to the highest quality and sourced from sustainable forests. Whether your looking for commercial or domestic fencing solutions, we can help. As one of the regions leading fencing suppliers you can be confident that we have, or can source all the fencing supplies requirements you could possibly need, be it for garden, agricultural or industrial use. We carry a full range of fencing supplies including garden panels , ideal for repairing existing fence lines or creating a boundary that will give you great privacy levels. Our standard fencing panels are available in standard widths of 6ft and all the standard heights, All panel heights are supplied in the metric measurment, imperial measurements are given for comparison only. Choose from overlap, feather edge or decorative fence panels depending on the look you want to achieve. All our panels are a standard thickness allowing them to be used with all the commonly available slotted concrete posts . Our euro garden panels are available in standard widths of 1.8m and all the standard heights. Choose from Elite stMelior, horizontal lattice top and the horizontal panel. Timber picket fencing supplies offer a simple decorative option at an affordable price. Lacking the privacy of traditional fence panels but adding a traditional decorative touch, our picket is available in panel format or as loose items depending on whether you want to create your own fencing, repair existing or go for a time saving option. Choose from flat, pointed or round top pickets in a variety of heights from 3 ft through to 6ft depending on the look you want to achieve. We can match your fencing with a picket style gate to suit. Trellis is a great way to add height to a fence, add a decorative touch or create climbing opportunities for plants. We offer all the standard types of garden trellis , concave, convex and flat top with either a diamond or square infill option. Looking for a stand alone option for attaching to walls or the face of a fence? We have fan trellis and a variety of full decorative panels that are ideal for privacy screens. Looking for traditional agricultural style fencing supplies or have existing timber fencing you need to make repairs to? We have a wide range of specialist tanalised timbers to help you create or repair any type of wooden fencing you can think of. We carry all the standard rails, posts, stakes and boards that you’ll need for rural post and rail, wire or feather edge fencing . Mesh and wire fencing is a great option for a quick, cost effective boundary delineation or for keeping livestock from wandering. We carry every type of supply you could need. Barb wire, razor wire, chicken wire, stock proof netting, aviary mesh or line wire. We have it all. Need winders, staples, line wire and tying wire? Look no further. Perhaps your looking for a greater degree of security than wooden fencing can provide? 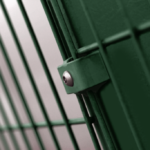 Check out our chain link, palisade and rigid mesh. We offer chain link fencing that is ideal for home or industrial use and a range of post options depending on your needs. Want an even higher grade of security? We can offer specialist metal security fencing to suit you needs and your budget. Give us a call with your requirements.